If you have numerous valuable assets, you need strong inventory control for your hardgoods, gases, and rental equipment that are constantly in motion. Keeping track of it all is seamless with TIMS Inventory Management. Whether by SKU, unit of measure, UPC codes, lot/serial number tracking or bin location, you’ll know what you’ve got in inventory, where it is, and who should be billed for it. Get your inventory under control for single and multiple warehouse locations. Delivery can be an organized, seamless, and profitable part of your business strategy. Automate your delivery system to optimize your daily procedures with TIMS Delivery. See exactly how a TIMS customer saved $4.5 million in one year by implementing TIMS Delivery. 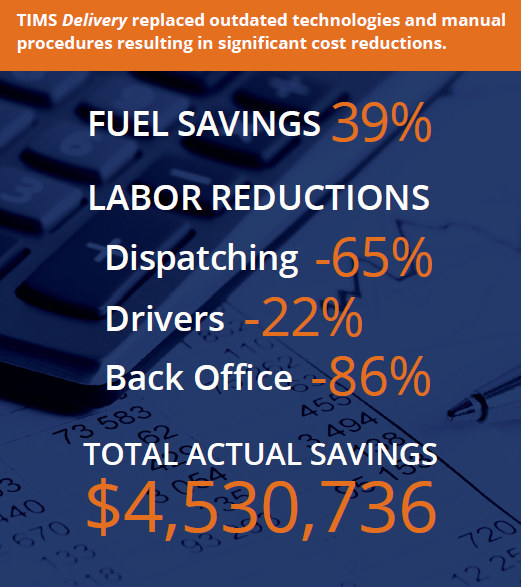 Reduce labor, delivery, fuel, and maintenance costs and, at the same time, increase daily deliveries per route.